← Half Birthday/First Valentine’s Day. Early in January of this year, I mailed President Obama a birth announcement for Liam. I included a letter, along with his full name and date of birth, Dylan’s and my name, and our home address. This past Saturday, Feb. 16, we received a letter back! 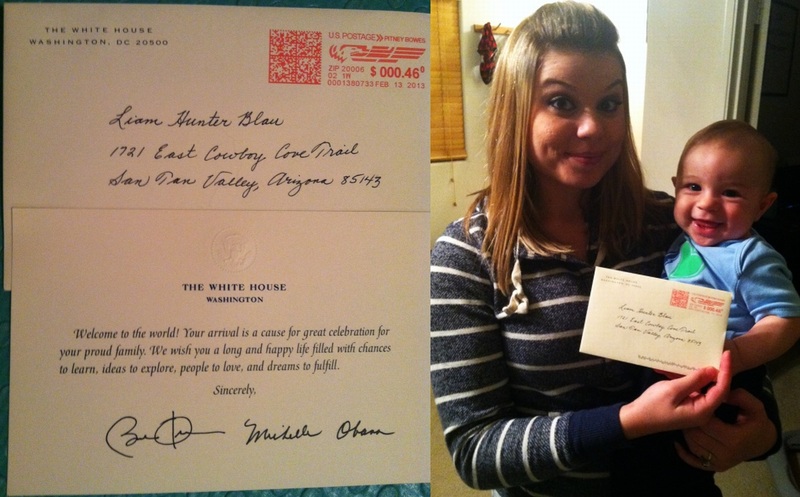 I was so excited to see a letter to Liam from the White House! I am so happy I have this keepsake for him, it’s historical and cool! I wish I had one!! You can also fax the information to 202-395-1232. What you will need to include with either request is the baby’s name and date of birth, the names of the parents and the address where you would like the greeting to be sent to you. This entry was posted in Uncategorized and tagged baby, baby announcement, Barrack Obama, birth, birth announcement, historic, historical, keepsake, letter, Michelle Obama, Obama, president, President Obama. Bookmark the permalink.